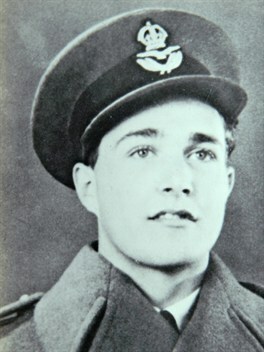 Born in New Delhi in 1922, Flying Officer Leslie Thomas Manser, (66542) posthumously earned himself the Victoria Cross for an act of bravery in his Avro Manchester, over Cologne on the night of May 30th, 1942. As a young child, he moved with his family to Radlett, Hertfordshire, England, was educated at St. Faith’s, Cambridge and Cox’s House Aldenham, Hertfordshire. Following this, he decided to join the Armed Forces. Attempts to enlist in both the Army and Royal Navy were unsuccessful, however, in August 1940, he approached the Royal Air Force and was quickly accepted. Manser was commissioned as a pilot officer in May the following year and after further training, was posted on 27th August to 50 Sqn at RAF Swinderby, Lincolnshire, operating Hampdens. His first experience of war, came very quickly. As a copilot, he was to join over 100 other aircraft in the Frankfurt raid only two days after his arrival. 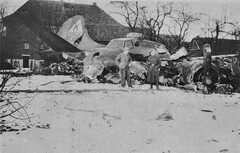 Further action saw him fly over prestigious targets such as Berlin, Hamburg and Karlsruhe before being posted twice to Finningly and then back to Swinderby, this time as an instructor. Following a brief service with No. 420 (R.C.A.F.) 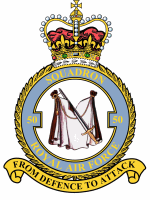 Sqn, again on Hampdens, Manser returned to 50 Sqn, this time operating from Skellingthorpe, Lincolnshire. It was here that he experienced for the first time, the ill-liked Heavy Bomber, the Avro Manchester. 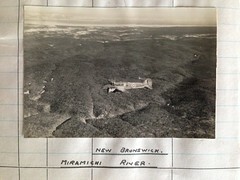 Manser flew a number of missions on this type including a leaflet drop over occupied Paris on April 8th. His skill as a pilot soon earned him promotion to the rank of Flying Officer just five days before his 20th birthday on May 6th 1944. With high losses and increasing ‘failures’, bomber command was coming in for its own criticism and despite some success, Harris was making enemies at home as well as overseas. It was now that he created his master plan “The Thousand Plan” codenamed ‘Operation Millennium’. This would involve over 1,000 British bombers, attacking one major German city in a single night. 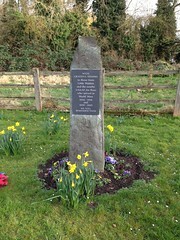 Churchill, impressed with the idea, gave Harris full support and the wheels of Operation Millenium were put in motion. 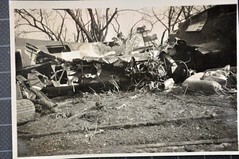 Aircraft and crews were pulled from every available source, many being taken from training units where crews were only partially trained and inexperienced. Orders were finalised on 26th May, and an initial date for the attack set for the night of the 27/28th May, the target would be Bremen. However, continued unfavourable weather conditions made Harris’s first choice unsuitable and then at midday on the 30th May, 1942, Harris issued the order to strike, that night, against his second choice of target – Cologne. The immense armada, which consisted of: Whitleys, Wellingtons and Hampdens, Stirlings, Halifaxes, Manchesters and Lancasters made up a force of 1,046 bomber aircraft along with an assortment of night fighters in support. On the morning of 30th, Manser and another pilot were instructed to collect two Manchesters from Coningsby, Lincolnshire. As many of these aircraft were drawn from reserves and training squadrons, it was inevitable that many would be in poor condition. Manser’s was no exception, it had no mid upper turret and a sealed escape hatch. When the order came and Manser took off, his aircraft L7301 ‘D’ Dog, an Avro Manchester Mk1, with a full bomb load of incendiaries, was now difficult to manoeuvre and he was unable to reach an altitude of more than about 7,000 ft. Hoping the main bomber force would attract the greater concentration of flak, he decided to continue on. They soon arrived over the target area and being lower, they were subjected to an immense barrage of anti-aircraft fire. Many of these shells struck the aircraft causing fires within the fuselage and the port engine. Careful nursing and a cool head by Manser, enabled them to eventually extinguish the fire which had now spread along the entire wing. Struggling to maintain any height and keep the aircraft airborne, the crew threw out whatever they could to lighten the load. with little power, the aircraft lost considerable height and Manser finally ordered the crew to bail out. Knowing his crew would not survive jumping as the aircraft swung and moved awkwardly, he fought to maintain level flight for as long as possible. Refusing his own parachute over his crew’s safety, he held it just long enough for them to get out. 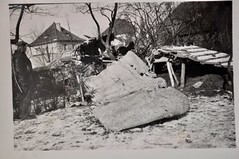 The bomber finally crashed a few miles from the Dutch border near to Bree 13 mi (21 km) north-east of Genk in Belgium and burst into flames with Manser at the controls, he was just 20 years old. Manser’s bravery came out following debriefing of the crew members, five of the six having made it home through the resistance network. Other members of the crew: Barnes, Horsley, Baveystock, Mills and Naylor all received immediate awards of the Distinguished Flying Cross or Distinguished Flying Medal. Leuven, Flemish Brabant (Vlaams-Brabant), Belgium. Plot: 7.G.1. Manser’s VC is on display in the Lord Ashcroft Gallery at the Imperial War Museum, London. Accept from me personally and on behalf of my Command and my Service, Salutations upon the signal honour, so well indeed merited, which his Majesty the King has seen fit to confer upon your gallant son. No Victoria Cross has been more gallantly earned. I cannot offer you and yours condolence in personal loss in circumstances wherein your son’s death and the manner of his passing must so far surmount, by reason of the great services he rendered this country and the last service to his crew, all considerations of personal grief. His shining example of unsurpassed courage and staunchness to death will remain an inspiration to his Service and to him an imperishable memorial. My father Bov Horsley was the Wireless Operator and after he bailed out was helped by the Comet Line to return to UK. He then went to Canada and trained as a pilot – he joined 617 on his return and stayed in the RAF after the War. Hi Erica, you must be so proud of your father, he and many others like him deserve our greatest respect and gratitude. Thank you so much for letting us know about him. Andy. 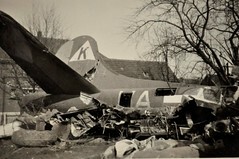 One more item: there were witnesses who say they saw Manser escape the cockpit after the crash. According to these men, Manser was on fire and collapsed against a tree and perished. 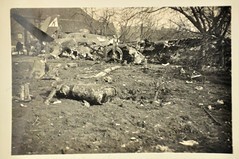 His crew also stated that he bombed the target on one engine. Leslie Manser could have turned back when the engine failed, but he did his duty knowing he was doomed. He was truly a very brave man, like Reid and hundreds of others. I wasn’t aware of the witness accounts thank you for letting me know. If you have any other details i would love to hear about them and add them to he page. There are simply too many brave young men for me to mention here but i shall write about aa many as I can. They were a remarkabke breed and like you say, how many people like that exist today. Thank you for the comments and for coming by. Plesae come back and read other posts i appreciate your comments. John Reid who continued on to his target despite serious injuries to himself and his crew. 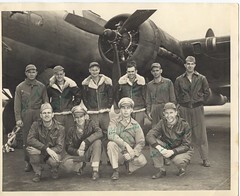 Both followed through on their missions, and Reid brought the surviving members of his crew home despite loss of port side hydraulics that precluded straight and level flight. Allies owe much of their freedom to men like Manser and Reid. Where are men like this today? I cannot say. Thank you for the infiormation. I have responded to your other comment. As Pierre said ‘We owe so much to these young men”. We must NEVER FORGET their courage, bravery and sacrafices. Wikipedia pays homage to him. We owe so much to these young men. We do. The age always surprises me. At just 20 it’s incredible how brave and selfless they were.